Why create an ‘Uplift Prize’ if the X Prize already exists? I was in fact inspired by the X Prize. However, note that the major prizes that the X Prize Foundation awards are in the $10 Million range, and are managed by a staff of multiple people. I seek to demonstrate that there is an entire layer of incentive prize activity that can be created in the sub-$100,000 range, with no full-time administrators, using tools and accessing expertise freely available on the web. I hope to inspire others to follow this template, and create all sorts of prizes for a wide range of objectives, effectively transforming the very concept of how charity should be done. Why choose potable water and self-replicating machines as targets for poverty reduction? Of all possible areas where we could incentivize innovation, these two are where the greatest upliftment can be achieved with the smallest dollar amount, at this time. For example, the Personal Manufacturing Prize enables disenfranchised people to start their own manufacturing ventures independent from larger manufacturers. It also reduces the problem of millions of tons of plastic waste surrounding the communities that the poorest people reside in. Why are the prizes hosted at Humanity+ ? Humanity+ is an established 501c3 nonprofit organization that advocates the ethical use of technology to expand human capacities. The synergies between Humanity+ and the Uplift Prize make this collaboration ideal. How do you determine the prize specifications? In detailed discussions with experts in the field, we revised the prize specifications dozens of times to ensure that it is not so difficult as to deter contestants, yet not merely addressing inventions that were going to happen anyway, while additionally not misdirected in a way that steers innovation away from the goal of poverty reduction. This fine line is not easy to walk, and the expert input that has gone into prize specification is the secret sauce behind the concept. RepRap sounds like science fiction. How can a machine reproduce parts of itself? Even I did not believe it as recently as 2008, but 3D printing is a technology that is coming to a home or business near you sooner than you think. 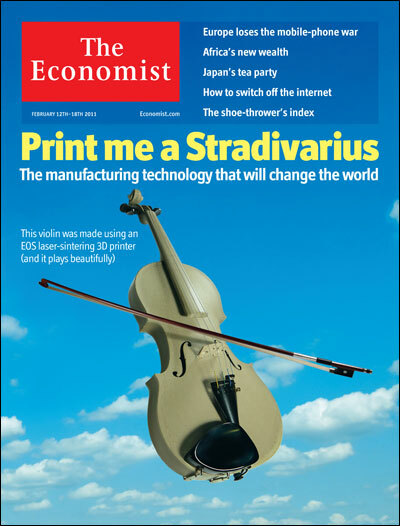 See this cover story of The Economist from February 2011. The next logical step is to print the parts of the printer itself, and create a new printer. This multiplies the number of self-replicating printers very quickly, and thus makes this a technology that can crack the seemingly ominous challenge of poverty. For good measure, we can use waste matter, such as plastic, as the printing material, and put that pollution to productive use. Please see the videos of RepRap printing elsewhere on this website. If you would like to see a world with such wonders soon, particularly in the hands of the most needy, please donate to the Uplift Prize, and get your friends to donate too! The material used for 3D Printing, isn’t making that inexpensive and abundant a challenge unto itself? The conditions of the prize stipulate that the material has to be below a certain cost. For this reason, we strongly favor those contestants who can use a material that is already the source of a major waste disposal problem. Certain types of plastic fit this description, of which 20 million tons are produced each year without being recycled in an effective manner. Much of this plastic ends up in the ocean, damaging the ecosystem. Why do you have an Interim Personal Manufacturing Prize, and why does it require publication of the winner’s results? The Interim Prize, awarded on 6/30/2013, is designed to adhere to the open-source spirit of the RepRap community and update all observers on the status of innovation in the field. Thus, after the Interim Prize is awarded, all contestants once again have the same information available to them as they prepare for the Grand Prize. How much of the money I donated goes to the Prizes? About 95% of the money you donated goes towards the Prizes. The only expenses are the administrative fees of the 501c3 donation interface and Indiegogo. Part of the objective of the Prizes is to show that administrative overhead is not needed. Contrast that to most other charity organizations, where only 30-60% of your donation goes towards the cause, because of compensation packages paid to full-time staff, office space, etc. The Uplift Prize has no such overhead. If you are going to be making a charitable gift to any organization that helps the less fortunate through traditional means, I request that you just divert 10% of that to the Uplift Prize. For example, if you are donating $100 to a charity that gives aid to starving children in Africa, please donate $10 out of that here. As explained elsewhere, that $10 is really worth as much as $10,000 of traditional aid in terms of impact against poverty. How much money do you aim to raise? The Interim Personal Manufacturing Prize is fully funded to $20,000. I aim to raise another $130,000 to fund the Grand Personal Manufacturing ($80,000) and Water Liberation ($50,000) Prizes. This will be done through a full range of fundraising avenues, such as courting large donors, to accumulating thousands of small donors through crowdfunding. I would actually prefer to raise the funds through thousands of small donors, so as to demonstrate the power of the Web 2.0 medium in marshalling scattered small donors to topple major obstacles, and to create a community of participants. All donations are tax deductible, and given current tax rates, a $100 donation can be made for a cost of just $50-$55 out-of-pocket for most people. Eventually, if there appears to be sufficient traction, I may raise another $850,000 to bring the grand total to $1 Million from start to finish. This final block of funds will be allocated to new prizes that will target additional areas of poverty reduction beyond those addressed by the water and personal manufacturing prizes. Why do you say that $1 donated to the Uplift Prize is equal to $1000 donated to a traditional charity for the poor? Tens of billions of dollars have been donated in foreign relief aid, yet the effect of this has been far lower than the amount of money would lead one to expect. a) The concept of a contest, that brings out superlative effort in innovators who otherwise may not shift to the highest gear. b) A selection of highly scalable technologies, at just the right time in their evolution. Deep knowledge in technology readiness level is required for this, which is what sets the Uplift Prize apart. c) A prize that addresses multiple problems at once, from water shortage to personal manufacturing access to management of plastic pollution. e) No chance of corruption standing between the innovations and the neediest people, since a local dictator who normally pockets foreign aid will not pocket water filters, and has no need to pocket a RepRap machine. f) Scalability that can help billions of people. RepRap, by definition, is where one machine produces another, and they both then produce yet others, etc. So, yes, I think that the $150,000 allocated to these prizes can make a bigger dent in the condition of the poorest people in the world than the $50 Billion+ already donated to them in the form of relief handouts. The old adage of giving someone a fish vs. teaching them to fish applies. How will contestants know how much money is raised? The Indiegogo campaign tracks donations real-time. Isn’t it hard for the contestants to focus if the funds are not already raised, and the fundraising is happening simultaneously? An entrepreneur starting a company has very little indication of what his payoff will be and when. But I do expect fund to be raised well before the deadlines for the Grand Prizes. What if the Prize goals as specified are achieved before the deadline? The Prizes will be awarded on the dates specified. If multiple contestants have exceeded the goals, the award will be given to the contestant who has exceeded by the most, as determined by a panel of judges. Who owns the rights to the winning inventions? The Uplift Prize does not own any IP from any of the contestants. For the water prize, the inventor will own the IP of their invention. Why do the Prizes have an ‘up to’ clause in the award amount? We set the bar very high in the prize criteria, because if the prize criteria are easy enough for many entrants to achieve, then no incremental innovation can be attributed to the existence of the prizes. If certain technological innovations were going to happen anyway, the prize is redundant, and the funds can better serve people elsewhere. The award size will be determined by how close the best entries get to the steep criteria. Note that in the 2013 Interim Personal Manufacturing Prize, the winner was awarded the full $20,000. Why have an Indiegogo campaign for fundraising if you already have the prize funds? a) Show that innovation prizes can be organized by individuals to solve seemingly gigantic problems, without a large organization behind them. b) Show that an individual can go to a non-profit incubator to start such a small endeavor, where the organizer need not worry about tax reporting, paperwork, and 501c3 status. c) Show that social networking technologies can raise and collect sizable sums of money through even through donations as small as $10 each. e) Get press and visibility for the concept of small, directed innovation prizes. What if no entry meets the Prize criteria? This possibility is real, since the prize specifications are set to be significantly above the technological trends. A prize is meant to be won by a superlative, surprising innovation and result, rather than just something within the trend. This is where a prize differs from a grant. If there are no entries that meet the criteria, then there will be no cash prize awarded. There will still be an honorable mention to recognize the best entry. I’ve found something that helped me. Thanks a lot!